Talk N Text ALWAYS ON mobile internet promo. For only Php20.00, get 45MB amount of data valid for 1 day. This is also similar to the Smart Bro ON 20. This works better and fast with your Opera Mini Browser. You can download Opera Mini HERE. To those other people, this TNT internet promo is not new. 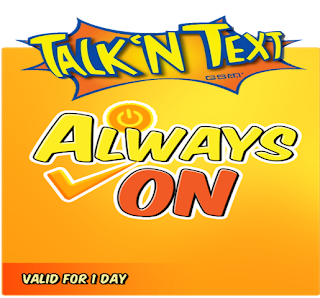 But to those who are newbies and first time in Talk N Text, let us share to you one of the popular internet promo of TNT. Want to register to this promo? Follow the instruction below. How to register to TNT ALWAYS ON internet promo? If your GPRS/3G connection is not yet activated, click ACTIVATE GRPS. Please wait for the confirmation message before browsing and surfing the net. 45MB is the valid data that can be access. You can open and access ANY SITES. If your 45MB is already consumed, text message will be send as your expiration notice. *This promo is valid to all TNT Subscribers and also to all Smart Bro Subscribers nationwide.